Deals in Delhi, Gurgaon, Ghazibad, Noida and Faridabad. We are providing premium quality Wi Fi Services for several IT needs to organizations. We provides you a fully managed Wi-Fi solution with support, backed with full network monitoring and management . MediaTek is a world leader for 802.11x Wi-Fi technology. All of our Wi-Fi products are certified by the Wi-Fi Alliance and deliver unbeatable performance. Wi-Fi or WiFi is a technology for wireless local area networking with devices based on the IEEE 802.11 standards. 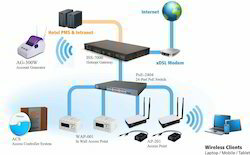 ... Wi-Fi compatible devices can connect to the Internet via a WLAN and a wireless access point. Such an access point (or hotspot) has a range of about 20 meters (66 feet) indoors and a greater range outdoors. 24 hour wireless internet connectivity available throughout the complex to ensure your business runs nonstop.